Last April (~so long ago~), a few friends and I retreated from the life of skyscrapers, graveyard shifts and endless traffic to go to San Juan, La Union, where our main aim was to relax, reflect and learn to ride the waves (optional). Since I do not even know how to swim, I will not even pretend to like the idea of trying out surfing. I passed on that opportunity and focused my attention on finding and dining at a local restaurant that will represent the taste of La Union. We had the most horrible bus ride going there (yes, talking about you, Partas bus line! ), arrived there just in time for sunset and spent our first night curled up in our beds with a documentary about aliens lulling us to sleep. The next day, of course, was a different story. We had our breakfast at Sea Nymph Surf Cafe which is located next to Sebay. Nothing fancy, nothing grand. But I noticed that a lot of people go here to eat. 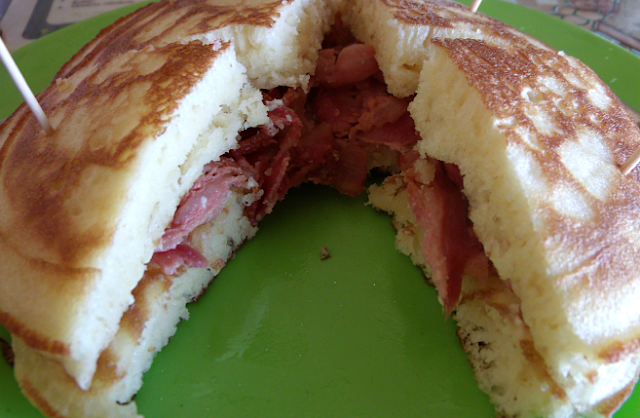 My friend, Muffet, always talked about Sea Nymph's pancakes with bacon and cream cheese, so we went there and ordered that. Not bad, I think, for it's price (around PhP 100, I forgot). This might not be Pancake House-level or whatever restaurant you go to, to eat pancakes, but the key is to stuff in more bacon! Also, I liked that fact that they use Maya Hotcakes (lol, support Maya!) that's why the pancakes were so fluffy. The cream cheese? Almost non-existent but I'd still have this anyway. For our late lunch, I just randomly picked this out of their menu. 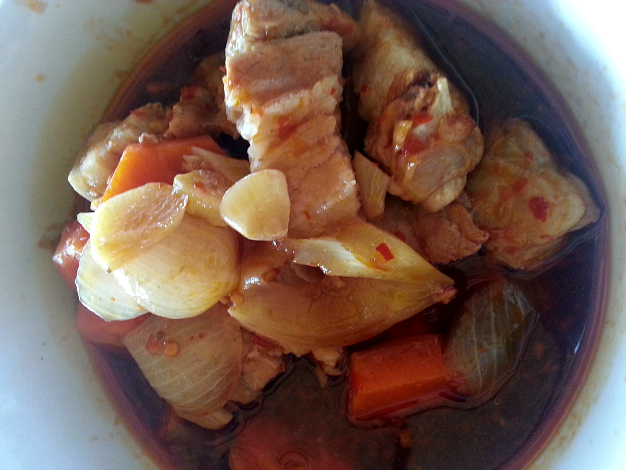 This is called Asian Pork Liempo. I was thinking of something grilled so I was surprised when this was served. But this is one of the best pork dishes I've ever tasted, no kidding.Or it's just that I've never tasted anything quite like this before. You get the point. It really tastes good. It's got that Korean cuisine vibe to it and the anise made the dish fragrant and even more flavorful. It was pure win on so many levels. This dish stole my heart and my stomach. As per recommendation by friends who frequent La Union, we went here to have our dinner. It was our last night there so we wanted the dinner to be extra special. I had no idea before that Halo Halo de Iloko was featured in a local channel's program. 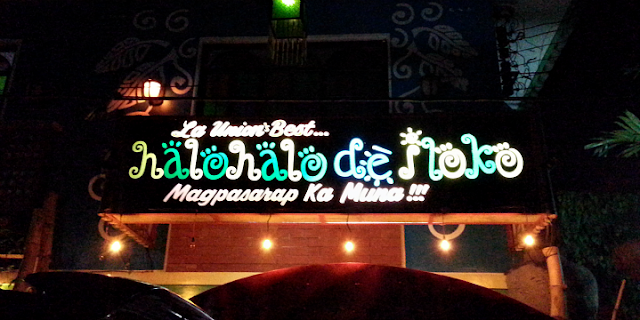 They just told me bagnet dishes here were great. Okay, that was enough reason for me to try this place. Fun, festive and homey. Those were the first three things that came to mind upon entering the place. A lot of interesting pieces that decorated the whole interior. My favorite would be that lizard light fixture in the middle! 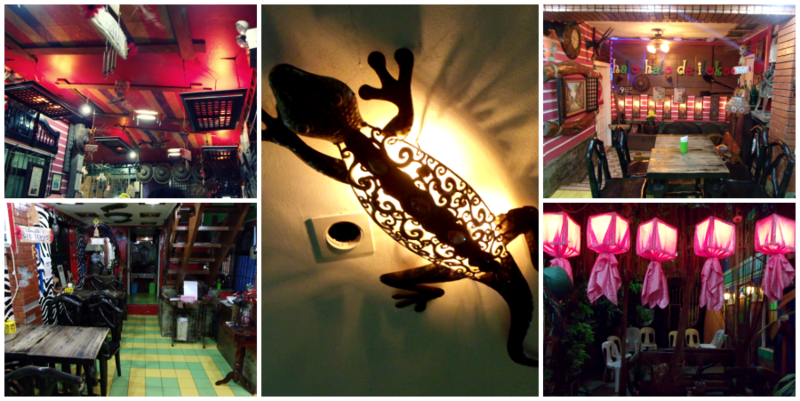 This place indeed has its own charm, reminds me of my grandmother's house we used to go to in Makati. There are little clutters here and there but it feels like home. And every corner is always different from the other! It was such a visual treat! 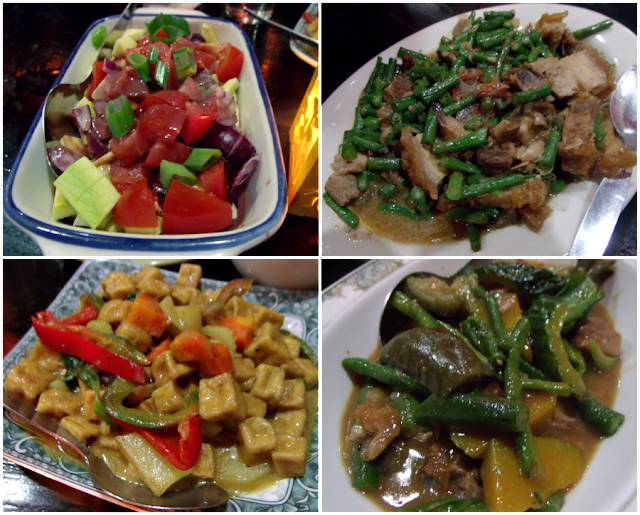 I think we also had sinigang that time but I forgot to take a picture.We really enjoyed our meal as our taste buds were tickled with a variety of flavors. Of course, it was more enjoyable because of the stories and laughter we shared over the meal! 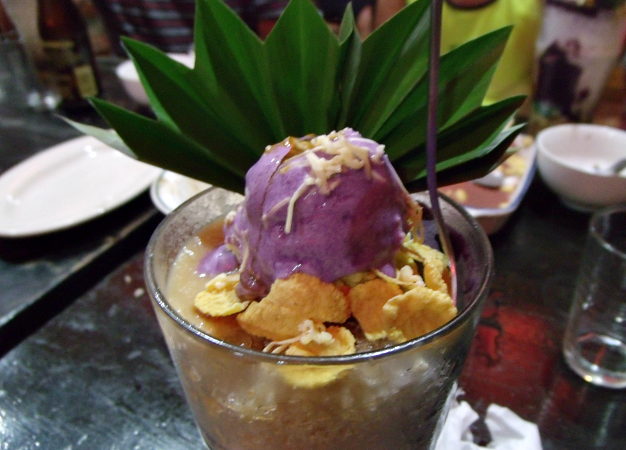 And here's the supposed house specialty, the halo-halo. I love the presentation! 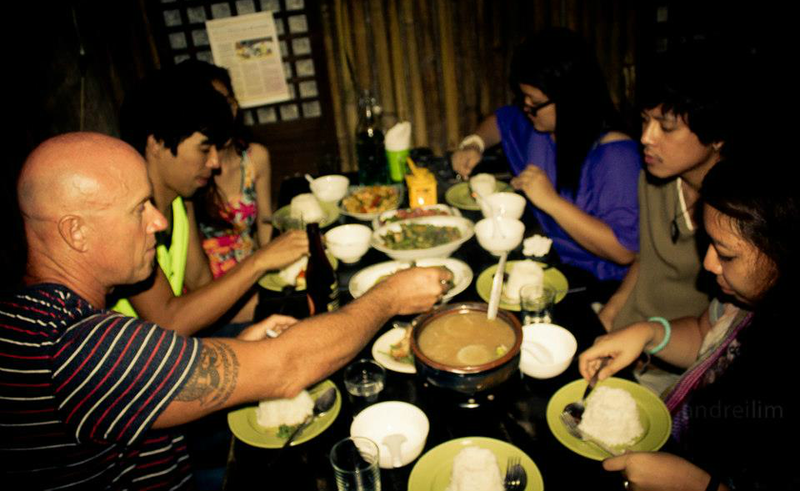 We saw on the other tables that one serving was huge so we ordered 4 to split to 7 people (lol math). I must admit that I'm expecting something extraordinary due to all the things I read about this dessert. I was surprised because it tasted... normal. Better than Chowking's but nothing mind-blowing. I kept expecting something like that. I thought maybe it's just my glass but apparently, my friends also thought the same. Oh well. But I'll still go here next time if I'm around the area to try other dishes. 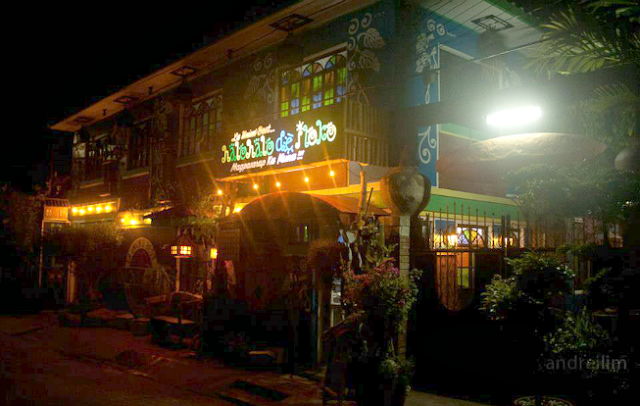 Next time you visit San Juan to surf or just chill, try both Sea Nymph Surf Cafe and Halo Halo de Iloko!